[dropcap]I[/dropcap] was sitting at the back table of my fourth grade classroom stuffing Friday Folders for my internship when a student walked up to me. Without saying a word, she smiled and handed me a piece of paper, folded in half just once. She was one of the creative personalities in the class, always with her colorful markers out on her desk decorating her notes and drawing pictures. It was such a small gesture, yet the note made my entire day. It made me feel important in the classroom I was helping. The warm feeling wasn’t solely sparked by the cute fourth grader; rather, it was just the idea that she had gone out of her way to write something to thank me for my time with her that made me feel so loved. With the world of media that swarm around society, it’s become so simple to communicate over text and email, using digital emoticons and acronyms like “LOL” to portray our emotions. It’s easier to type out messages where autocorrect fixes mistakes, and the backspace and undo features make it effortless to word something a little differently than in the original draft. The shift away from script writing is revealing itself in schools across the world, as countries such as Finland have dropped handwriting classes and replaced them with typing classes, according to BBC. Additionally, the U.S. Postal Service’s annual survey in 2010 showed the average home only received a personal letter once every seven weeks. 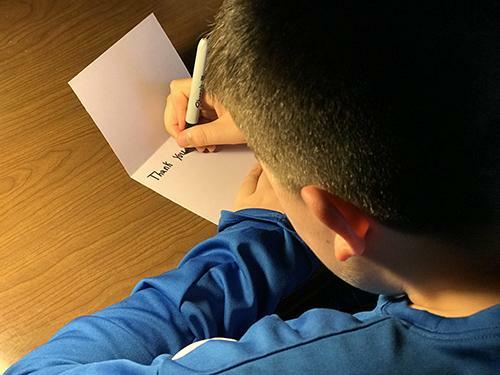 While the technological advances have made us a more efficient, effective society, we should still prioritize the importance of writing handwritten thank you notes. The concept reminds me of the day after Christmas every year. My mom calls my brother and me into the kitchen, where she has many cards laid out for us, all white, bare and ready for us to write to our family members about how we’ll use our Christmas gifts and how we are so appreciative of what they gave us. The annual process seems tedious and fake, but it does help me remember who gave me which gifts and makes me think about why it is I’m thankful for them. After I overcome the frustration of my mom making me write the notes, I feel overwhelmed with gratitude that I hadn’t felt before because I had just taken the time to write out those feelings. Handwritten notes are so powerful because it’s not as easy to write them as it would be to write an email or text. It’s difficult and takes time to neatly write out words without mispelling or smudging the pen. Additionally, the writer has to think about what to write before he or she puts it on paper because it’s much harder to go back and erase or cross out the draft if the writer wants to change his or her wording. The writers have to take their time to really think about what they’re thankful for, realizing all the different things they could say to the person on the receiving end, as well as an infinite amount of ways to say it, and that helps the writer realize how thankful they really are. Furthermore, according to an article by scientificamerican.com, people learn better when they write things out rather than typing because of the advantages of conceptual processes that longhand notes evoke. Therefore, writers learn what they’re thankful for as they write it out, helping them remember their gratitude in the long-term. The average office worker receives 121 emails per day, according to templafy.com. If the writer sends a thank you note via email, the receiver may look over it or only have time to glance at it before he or she moves. Traditional snail mail is not as overwhelming. A nice envelope with that person’s name written on it will draw attention among the other bills and notices that come in the mail. People may even be excited when they see personal cards made out to them. I know I still get excited when my birthday rolls around and I receive my annual letter from my Aunt Elaine even though I know the inside of the card will only contain a handful of confetti and the occasional two dollar bill. Moreover, while emails are easy to delete and forget about, physical thank you notes can’t just disappear at the click of the button. I have a box in my closet where I keep notes written to me throughout the years, and sometimes I’ll sit down and read through them. The impact of permanence, said John Coleman from the Harvard Business Review, makes the note more memorable for the receiver. All in all, handwritten notes are powerful to the writer and the receiver. As in my case, I felt grateful after I wrote the note to my family members, and I felt important after I received the note from the fourth grader. The power of taking time to sit down and write something by hand creates a sense of accomplishment in the writer, and knowing that the person took that time to write the letter makes the receiver feel as if he or she has done enough to deserve that time. Verbally saying “thank you” after receiving a gift is important, but following up with a written letter shows an even deeper thankfulness to the giver. Therefore, we should continue to take the time to write handwritten thank you notes to those who have given us their time or given us gifts. Even as technology continues to evolve, the importance of writing our gratitude to others should not disappear. According to happierhuman.com, the benefits of having gratitude are endless. People who regularly express gratitude tend to have better sleep, deeper relationships, happier memories and so much more. Handwritten thank you notes can be the catalyst to this healthier life because of the investment put into articulating thankfulness. Old fashioned ways of communicating may be on their downfall, but writing thank you notes doesn’t have to be. Appreciation never gets old.